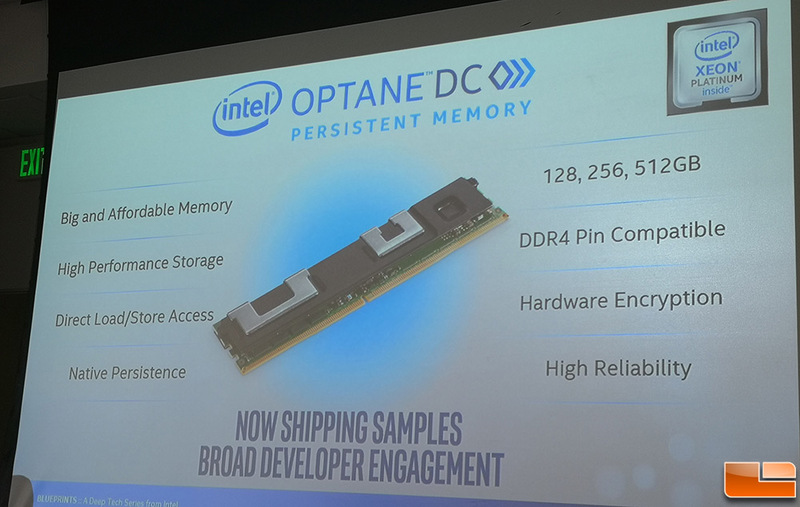 Legit Reviews attended an Intel Data Center Group (DCG) tech briefing this morning where Intel Optane DC Persistent Memory was announced. Intel Optane DC persistent memory is a new class of memory and storage technology architected specifically for use in the data center, where more and faster memory is needed to drive innovation. Intel Optane DC Persistent memory is currently sampling, but there will be 128GB, 256GB, and 512GB modules for sale to select customers this year with broad availability in 2019. 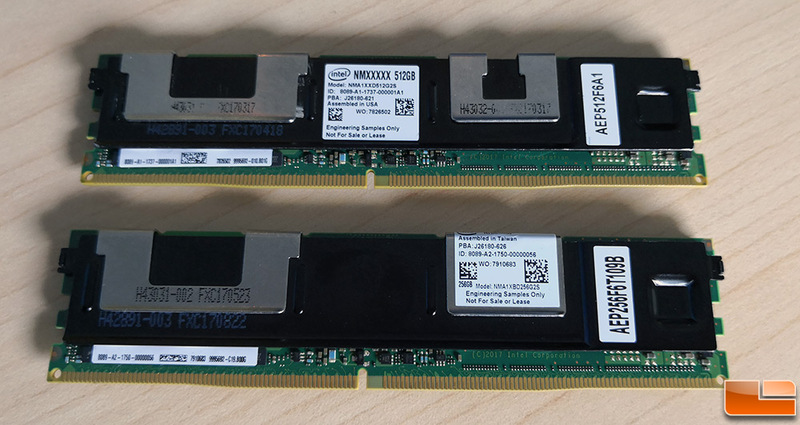 The modules operate in DDR4 memory slots over the DRAM bus that is directly connected to the processor. You’ll be able to use multiple sticks with a single server and will be able to have an impressive 3 TB of memory per CPU socket. Intel is not ready to discuss clock speeds, power requirements or mixing and matching DDR4 with Optane DC Persistent Memory at this time. All of that will be disclosed closer to launch. This announcement today is a broad overview of what is coming and how it is poised to change the storage industry. 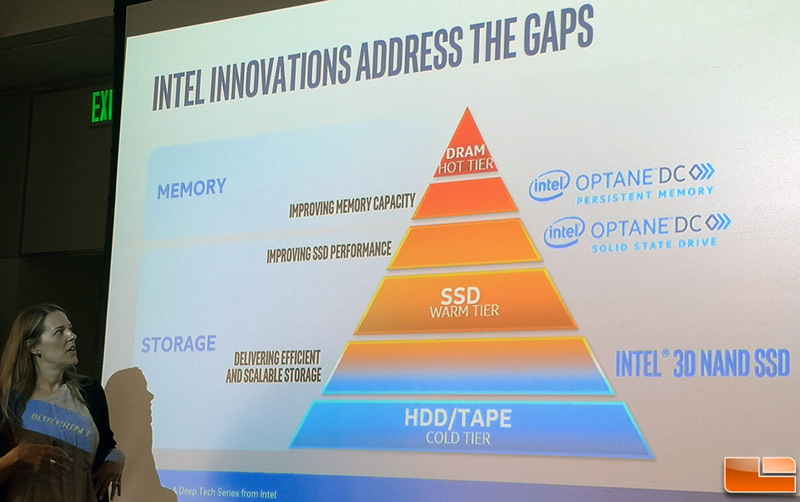 Intel’s VP of Datacenter and GM of Xeon, Lisa Spelman, explained that Optane DC Persistent Memory will allow systems to have more data near the processor than ever before and the performance will be improved as its directly connected. Intel did show a couple fun demos and shared some interesting benchmark results with us while we were there. 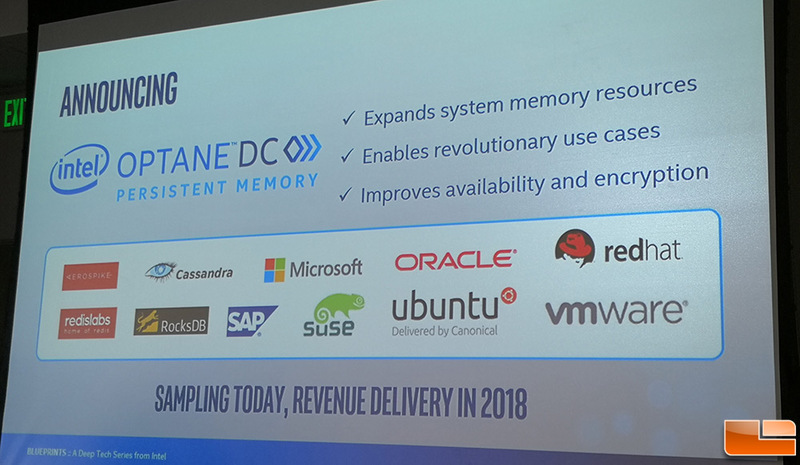 Intel VP and GM of Datacenter Memory & Storage Alper Ilkbahar showed how a simple database restart could greatly improve with Optane DC Persistent Memory. 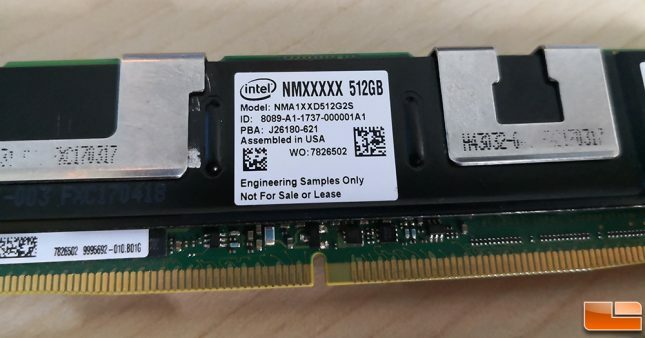 We were not told how large the database was or hardware specifics, but Mr. Ilkbahar showed that it took 2,100.3 seconds restart on a typical DRAM-only server versus just 16.9 seconds with it being restarted on Intel Optane SC Persistent Memory. This is a massive 124.5x performance improvement over DRAM, but it also allows datacenters to be able to say they have 99.999% uptime and still do a number of restarts on any given day. Many data storage companies offer some sort of uptime Service Level Agreement (SLA), so this will drastically improve performance and allow them to keep any downtime to a minimum. This is because the data being stored in the persistent memory won’t disappear after a reboot and nothing has to be reloaded. Once the server comes back online, the data will become accessible again. Planned restarts of a NoSQL in-memory database using Aerospike Hybrid Memory Architecture will see huge performance gains. 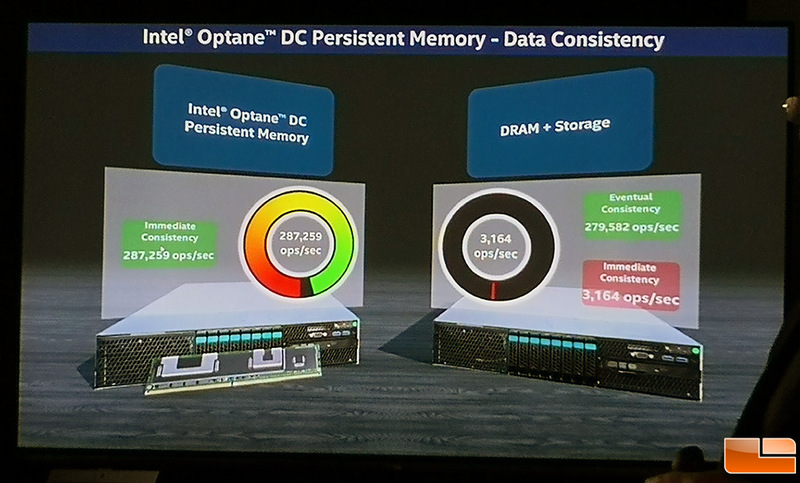 Intel also showed that Optane DC Persistent memory has insane data consistency performance. 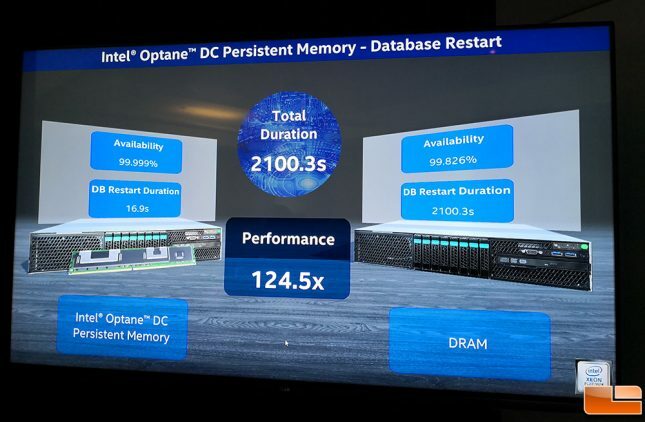 The example we were shown is that an Optane DC Persistent Memory powered system had an immediate consistency of 287,259 ops/sec whereas on the typical DRAM + Storage server it got only 3,164 ops/sec of immediate consistency (279,582 ops/sec of eventual consistency). 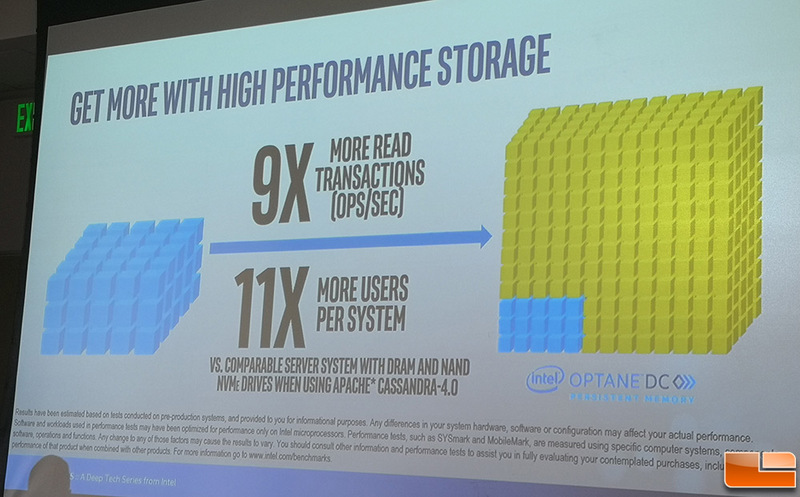 Intel claims they are able to get 9x more read transactions and 11x more users per system with Optane DC Persistent memory versus a comparable system with DRAM and PCIe NVMe SSDs with NAND Flash when using Apache Cassandra-4.0. 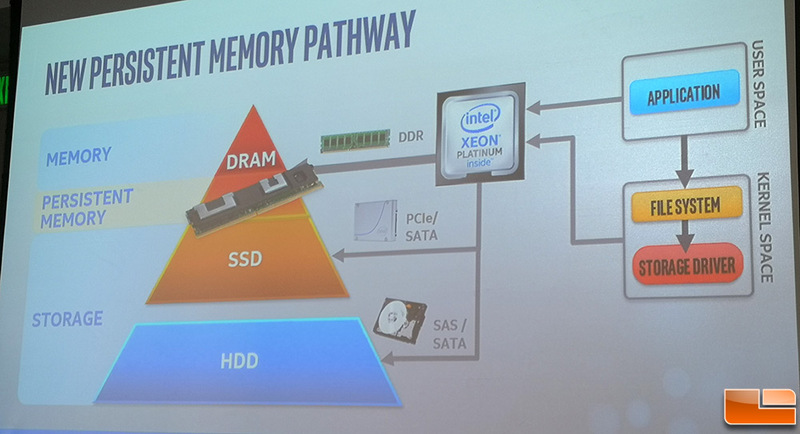 These comparisons show that Intel is ready to disrupt the datacenter big time here! Intel informed us that you’ll need to be running a Cascade Lake Xeon processor to run Optane DC Persistent Memory and from the sounds of it not every CPU is supported. Current generation motherboards should support the modules after being updated to the latest BIOS/UEFI release, so check with your board supplier to see if it will be able to support Intel Optane DC Persistent Memory down the road. The really big news is that Intel wants developers to try out Optane DC Persistent Memory and see what they can do with it. 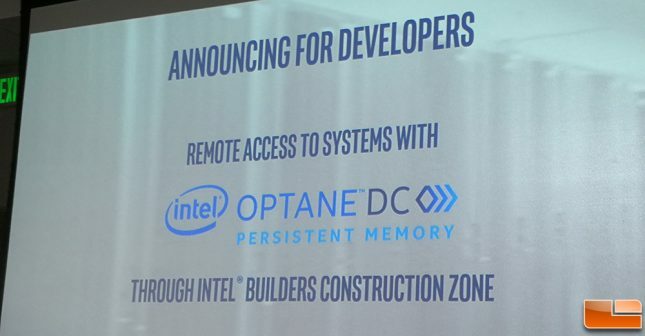 They are offering ‘free’ remote access to servers with Optane DC Persistent Memory so qualified folks can do real-world testing! You can apply to the program here and applications will be accepted from May 30, 2018 until June 13, 2018. Previews will take place between June 13, 2018 and August 24, 2018. Intel has an introduction to programming with persistent landing page that is worth a look as well. We’ll keep you informed on more Intel Optane DC Persistent Memory news as it breaks!